Tempeh food is a traditional Indonesian dish made from fermented soybeans that bind into a patty form. This versatile dish is full of probiotic goodness and can be used to add rich flavors and textures to your meal. If you’re unfamiliar with tempeh and are asking “Where can I buy tempeh,” the answer is practically any grocery store! Trader Joe’s Tempeh is especially favored. Here are 19 irresistibly delicious vegan tempeh recipes. Potsticker dumplings are traditionally fried. But you can easily bake them for that extra crunch and health. Heat crumbled tempeh, garlic, carrots, mushrooms, ginger, and green onions in a skillet. Add soy sauce, starch, maple syrup, and vinegar right before switching off the flame to create an imitation a delicious Chines dumpling sauce. Fill vegan wonton wrappers and bake at 1500F for 10 minutes. Serve with soy sauce. Blend 1 avocado, 1 cup pineapple, 1 cup orange juice and a tablespoon vegan tahini on high. Toss it over chopped baby lettuce, pineapple cubes, sliced banana, and romaine lettuce. Add 1/3 cup chopped macadamia nuts to the salad. Meanwhile, stir fry tempeh food in coconut oil until evenly browned on both sides. Serve on a separate plate as a side dish or add to the salad when cooled. Tempeh bacon has the smokiness, saltiness, and slight sweetness of meat bacon right down to the point. This meal is delicious and can be easily made in three parts. Cook the oatmeal on medium heat and add in a dash of hummus salt and pepper for flavor. Sauté kale in a skillet while the oatmeal is cooking and add pre-cooked black beans. Cook the tempeh bacon in the same skillet until slightly charred and place it on the oatmeal with kale. Top with hummus and avocado half. Crumble 8 ounce tempeh food in a large mixing bowl and add 2 cloves garlic, 1 cup tomatoes, ½ cup onions, 1 jalapeno, chili powder, cumin, lime juice, garlic powder, onion powder, oregano, and chipotle pepper. Flip the vegetables and tempeh mixture over medium flame. 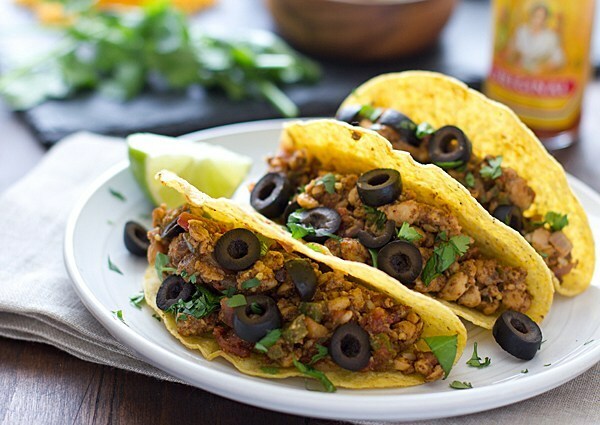 Heat the taco shells while your tempeh food is cooking. Once done, fill them with the tempeh mix and top with vegan cheese. Set aside to allow the cheese to melt and serve with guacamole, salsa, hot sauce, cilantro, black olives, and lime wedges. This healthy alternative to French fries will leave you grabbing for more, guilt-free. Slice the tempeh lengthwise to make ‘French fry’ shapes (about 1/4-inch thick sticks) and simmer for about 10 minutes in a cup of vegetable broth or plain salted water. Drain well and leave it in the refrigerator while you combine cornmeal and salt in a small or medium-sized bowl. Take out tempeh and roll well in the mixture to coat evenly. Cook tempeh over medium high heat taking care that each side is cooked thoroughly. Serve with vegan mayonnaise. Braise a 10-ounce tempeh food brick in vegetable broth and soy sauce for 10 minutes to soften it (reserve the braising liquid). In a separate pan, crumble the tempeh and sauté it until brown, which should not take more than 10 minutes. Combine pineapple juice (canned), 2 tbsp. brown sugar, ¼ cup vinegar, 1 red pepper, 1 onion and 1 tbsp. cornstarch in a saucepan. Pour in the reserved braising liquid and stir. Cook until the sauce has thickened and add pineapple chunks and tempeh cubes. Serve over whole grain of choice or couscous. Cut 8 ounce tempeh into thin strips and cook evenly on both sides in 2 tbsp. olive oil. While the tempeh is browning, combine teriyaki sauce ingredients together in a separate large mixing bowl – ¼ cup brown sugar or vegan honey, ¼ cup soy sauce, ¼ cup rice vinegar, 1 chopped chili, 1 tbsp. sesame oil, 3 cloves garlic and 1 inch grated ginger. Pour the sauce over cooked tempeh without switching off the flame. Cook for another 5 minutes until the sauce has thickened and serve with brown rice or quinoa. In a small bowl, whisk ¼ cup soy sauce, 1 tsp. each chili powder, hot sauce, cumin, liquid smoke, garlic powder, and onion powder, and ¼ tsp. pepper. Pour over 8 ounce tempeh food (cut into thin chunks) and cook over medium heat in a skillet. In a medium bowl combine 2 cups red cabbage, 1 cup mango, ½ cup cilantro, 1 tbsp. fresh lime juice, 1 tsp. apple cider vinegar, 1 tsp. agave nectar, and salt. Scoop the tempeh food into the baked tortillas and top with mango cabbage slaw. This is a spin-off from the traditional chicken salad. Boil shredded tempeh and fry for about 2 minutes. Combine the cooled tempeh with vegan mayonnaise, lemon juice, onion, celery, dried parsley, curry powder, and cayenne pepper, making sure everything coats nicely. Enjoy your vegan tempeh ‘chicken’ salad with lightly toasted pieces of bread or stuffed into pita bread. Heat oil in a large skillet and cook onions until softened. Stir in crumbled tempeh and add sugar, garlic powder, bell pepper, zucchini, corn, red wine vinegar, soy sauce and cayenne. You can also add tomato sauce or tomato paste. Spoon onto rolls and serve hot. Halve an acorn squash and bake after removing seeds, until tender. Boil wild rice in a saucepan and sauté crumbled tempeh in a skillet. Combine cooked rice, tempeh, pomegranate arils, cilantro, thyme, oregano, salt, and pepper in a large bowl. Stuff both hollows of the squash with this mix and bake for another 10 minutes at 4000F. Top with tahini and chopped cilantro. Steamthe tempeh first and slice width wise once cooled. Marinate it in olive oil and soy sauce for 20 minutes. Transfer the marinated tempeh to a baking pan and bake for ten minutes at 37500F. Brush tempeh with barbecue sauce on both sides and return to oven for another 10 minutes until the sauce has baked. Serve with a yogurt dip. In a large bowl, toss kale leaves, green onions, two handfuls of cilantro leaves, juice of one lime and a bit of olive oil, salt, and pepper. Using a food processor, make a paste of green onion whites, lemongrass, chili, ginger, and garlic. Add to the salad. In a skillet heat coconut oil and shallow fry chopped tempeh until evenly browned on both sides. Mix with the salad and top with sesame or hemp seeds! Bake 4 russet potatoes for 50 – 60 minutes. In a medium bowl, whisk crumbled tempeh, soy sauce, hot sauce, 1/2 teaspoon garlic powder, maple syrup, liquid smoke, 1/2 teaspoon onion powder, 1/2 teaspoon smoked paprika, and cumin. Remove potatoes from the oven and scoop out their middles after cutting them in half. Scoop tempeh dressing into the cavities followed by vegan cheese sauce and bake again for 15 minutes. Serve with fresh cilantro dip. Sautee crumbled tempeh till light brown and mix in soy sauce until it dissolves and coats the tempeh evenly. Add in onions, garlic and bell peppers until barely soft. Reduce heat and add sliced green chilies, kidney beans, diced tomatoes, chili powder, cumin powder, and cayenne pepper. Allow to simmer for 20 minutes. Garnish with fresh cilantro and serve hot. In a large soup pot, boil chopped onion, carrots, and tomatoes. Add in vegetable broth and simmer for 15 – 20 minutes. Using an immersion blender make a fine soup-like consistency. In a separate skillet sauté crumbled tempeh until it cooks evenly on both sides. Add dill to the tempeh and cook for another 30 seconds. Stir the tempeh bits in the soup pot and bring to a rolling boil. Ladle the soup into bowls and top each bowl with freshly whisked yogurt and minced cilantro. In a large saucepan, bring coconut milk to a simmer, reduce flame and stir in green curry paste, brown sugar, coconut aminos, garlic powder, kosher salt, and pepper. Stir in tempeh pieces and cook for 5 minutes before stirring in peas. Cook over simmer till everything is soft. Serve with rice, quinoa, or any base of your choice. Steam diced tempeh for 10 minutes. Whisk together mustard, maple syrup, olive oil and soy sauce till emulsified. Add streamed tempeh to this marinade and leave for 30 minutes. Spread the tempeh on a prepared baking sheet and bake for 10 minutes on each side at 4000F. Allow it to cool before serving with a vegan dip of your choice. Steam tempeh for 10 minutes on high flame and set aside to cool. In the meantime, sauté onions, carrots, green beans, and garlic until soft and aromatic. Add vegan butter and allow it to melt before adding flour. Stir and cook for a few minutes and then add tarragon and cayenne. Pour vegetable broth and bring to a simmer. Stir in crumbled tempeh and reduce the heat until sauce thickens. Spread evenly on baking dishes and top with mashed potatoes. Bake the dish for 20 minutes at 4000F or until the potatoes are warmed through. Let it cool for 5 minutes before serving.